Your pool and spa is a long-term investment that you, your family and friends will enjoy year after year. Now, there’s an easier way to enjoy that investment more often, more reliably and more efficiently throughout the year… The Raypak pool and spa heater. Think about being able to use your pool or spa at the perfect comfort level even when Fall arrives… Or when the first chill of Winter is felt in the wind… Or in the Spring or Summer when evenings can turn chilly in a minute! Helping you get more enjoyment from your pool or spa is the smart idea behind the Raypak heaters. Features: PolyTuf Textured Powder Coating. The Raypak gas heater has a polyester-coated, non-corrosive cabinet that is more durable than solventborne- and waterborne-coated metal cabinets. Every piece of sheet metal goes through a 7-stage wash system, making certain the powder paint has a perfect bond. Underneath the tough, yet beautiful finish you will find galvanized metal that offers superior rust prevention and years of durable service. Wind-Resistant Design No need for fans to com. Bat drafting problems under normal conditions. This heater is designed to draft naturally in outdoor installations with its exclusive low-profile design. It is so thoughtfully and carefully designed, it actually protects itself from the things that tend to stifle ordinary pool and spa heaters. It delivers uninterrupted heating performance regardless of falling leaves, wind, airborne debris, rain, downdrafts, updrafts, sleet, snow, etc. The millivolt ignition system does not require external power. It generates its’ own current internally, with a small thermocouple driven by the constant pilot. The millivolt ignition system is not available in California for natural gas units. Polymer headers prevent rust stains from harming your pools surface, giving you years of trouble-free swimming pleasure. Manufactured under Patent No. The fin tubes of the heat exchanger are each made from a single piece of extruded copper. This integral-fin design allows maximum heat transfer to be attained and maintained. Not for use on salt water pools. Stainless Steel Tube Sheet. 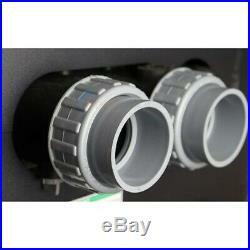 Stainless steel tube sheets are used on all Raypak heaters with the polymer headers. This allows for a completely nonferrous waterway, leaving your pool truly rust-free. CPVC 2 Water Connections. Standard with every Raypak is a set of 2 slip-fit CPVC water connections to make your installation secure and effortless. The Unitherm Governor inside the header helps reduce condensation from low inlet water temperatures. It automatically regulates the water flow to help keep the water temperature in the heat exchanger above 105°F. Both water temperature and water flow rate are controlled to eliminate condensation, sooting, and scale build-up that can shorten heater life. 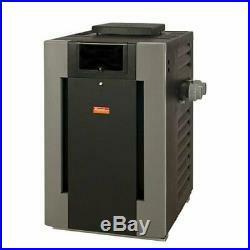 The Raypak gas heater comes with an automatic bypass built into the header. Every burner tray is built to last, from the stainless steel burners to the aluminized metal used in the heat sensitive areas. Innovative design allows for the easy removal of the tray and burners for servicing. A ceramic fiber combustion box keeps your heater running efficiently while keeping the outside jacket cool. By using this space-age material the heater won’t retain residual heat after it is turned off, allowing it to be installed without the use of costly metal heat sinks. Energy-smart Raypak heaters consistently achieve the highest efficiency ratings. They exceed all federal and state standards. The item “Raypak 009216 Digital Natural Gas 206,000 BTU Pool Heater” is in sale since Friday, February 8, 2019. This item is in the category “Home & Garden\Yard, Garden & Outdoor Living\Pools & Spas\Pool Equipment & Parts\Pool Heaters & Solar Panels”. The seller is “poollife15″ and is located in Fort Lauderdale, Florida. This item can be shipped to United States.